In a simple definition, motor stalling means that the electric motor has more load on it than it is designed for and it can no longer supply enough torque to keep it spinning. In general this could happen at all types of motors. The main thing is when the load torque has increased more and more (which is above the characteristic of the main torque of the motor) so called "overload region" where the motor develops its maximum torque. At this point if the load torque is further increased the speed will automatically be reduced and this procedure is called 'stalling'. If you can picture in your mind's eye the induction motor torque speed curve. The normal running position is on the downward slope. As the load increase beyond the capability of the induction motor, the slip increases and you move up the torque curve. The torque increases as we are applying more power and the speed is decreasing. Torque = (Power Mechanical x 9550) / speed. Therefore power up, speed down. Torque up plus, plus. It continues up the curve to the apex. Here no matter how much more current we draw (increase in power consumption but not output), we cannot get any more magnetic field to keep the torque rising so the speed continues to decrease until the electric motor stops. It is now stalled. There is no back EMF and the current rises exponentially and the electric motor burns out. This is why we have protection against this. 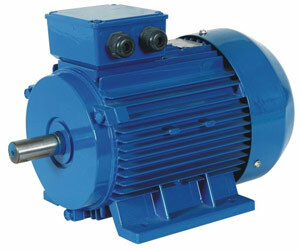 Electric motor stalling can be either mechanical or electrical. If an induction motor is stalling, there will usually be a vibration and even a buzzing or humming sound. Mechanical stalling is typically the result of the driven device being unable to move. Electrical stalling, especially in a 3 phase induction motor, typically is result of a single phase or missing phase condition. When a squirrel cage induction motor is started DOL (direct on line at 50 Hz or 60 Hz), its torque is a function of its speed (or slip). In general the machine develops a first starting torque (i.e. 60% of the rated torque or more) that increases gradually up to a certain speed, then jumps up to the maximum torque capability (i.e. 200%) and finally jumps down when it gets close to the rotating magnetic field speed (synchronous speed). This available torque can however be reduced by the voltage variations during starting (due to its inrush current vs. grid power). For example, if a quadratic load is applied (i.e. pump, fan...) and not enough margins are considered, the electric motor might not be able to accelerate the coupled inertia (stalling conditions) in case of particular voltage drops at its terminals (i.e. 20%). There is actually a speed zone where the motor torque and load curve are normally near one each other, this speed zone could become critical in case of voltage drops or load variations. How to perform secondary injection on relay for motor stalling function?